Pickup game's are game's where player's can play against each other in a more experienced/competitive environment, these game's tend to use mumble or teamspeak3 (mumble is the most used at the moment) for communication and run more experienced/comp setting's and maps for better gameplay. Generally the gameplay is of a much higher level then public server's and teamplay is a lot greater, because everyone is communicating and people tend to know when to defend/attack, where to hold positions and how to use the item's. I hope everyone who plays pickups will post there demo's here and what position they are playing, hopefully people can learn things on map's and I hope it encourages more player's to get playing and how fun organised and communicated game's can be, and hopefully get better with time and help get pickup/clan activity going towards a 1.0 release and player's familiar with the popular pickup maps so we can have good tournament's in preparation for the future and 1.0. Good quality maps for good 5v5 gameplay TO START OFF WITH: moonstone, attic, courtfun, implosion, geoplanetary, newtonian nightmare. 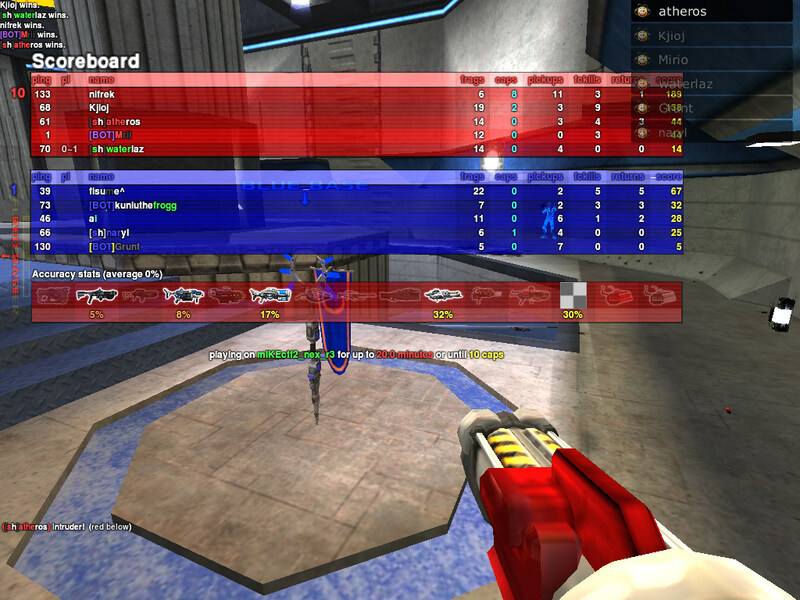 (last 3 not played in pickup yet personally, but have good CTF gameplay). Hydrophobia still needs to be tested/played on but hopefully it'll be added soon. Goal is to start off with a small-medium maplist so player's can get used to the maps where and how to defend/attack and so we can can concentrate on learning a small but good quality set of maps. I will have a short CTF guide up later for these type's of game's just something basic which will explain positions to defend, brief discussion about item's & powerup timing and more, hopefully Dokujisan will put it up once it's done tonight. http://kojn.mkzelda.net/kojnPOV_pickup_moonstone1.dem (Midman - FC backup and defensive helper..I normally defend and am not used to this position, first time on this map doing it). Please post your demo's from pickup games, it'd be nice in the future if we can get a site where we can upload our demo's instead but for now I hope this will encourage activity. #xonotic.pickup (mainly EU players as EU servers), I hope the US will get something similar going. More game-mode's to be added in the future, but will need more servers, if anyone can help out let us know. Lastly a big shout-out and thanks to all player's currently playing, atheros for managing the server and shell clan for hosting the first pickup server. We need minsta+hook server on this! You minsta guy's have a lot of server's so i'm sure it won't become a problem, just make sure to set it to private otherwise everyone join's and it become's a right mess to get people to leave/spec who see it in the browser list. As usual I play in these pickups in the last time, too. Ok here my demos of the 5v5 CTF games that we played lately. A little overview about teams and results included. We will play(/test) more Xonotic maps as soon they get on the server. Moonstone and Attic ( ) are nice maps for 5v5! Everyone who wants to get better and play with decent guys should join #xonotic.pickup !! I added a new folder. kojnPOV_pickup_attic060111.dem (defence) - rather boring game this one, not a lot to defend for first 10 minutes. kojnPOV_pickup_moonstone060111.dem (attack) - After 1st minute swapped from def to att. Moonstone is a good watch, as I had some good backup at the middle of the map a few time's due to good comms on mumble..team was unlucky not to get a capture after a 3 man cover back to base. I played my first CA3v3 tonight... It was the first fun experience I've had so far with all weapons! It was an intresting game with good teamwork on both sides. Was a pleasure to participate in this game, hope to do more of this soon. 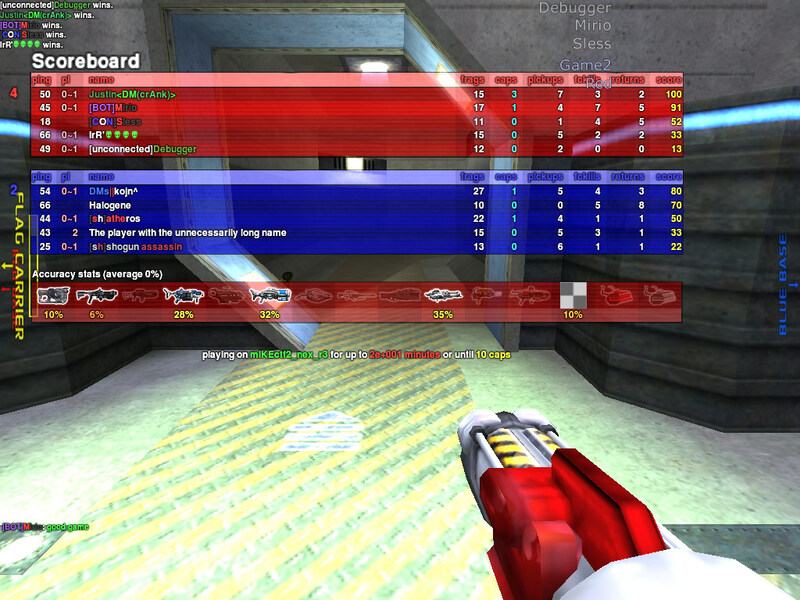 Note: Video of the mIKEctf2 will come soon. Same games as Mirio mentioned before. Finally the video of the mIKEctf2 game! Attic was a very close game like usual. Once there was a damn amazing fight for the flag of the Blue team where 3-4 guys of every team met at one place (we had like 4 FCs within some seconds). In the end we needed overtime to find a winner and Red team did it. 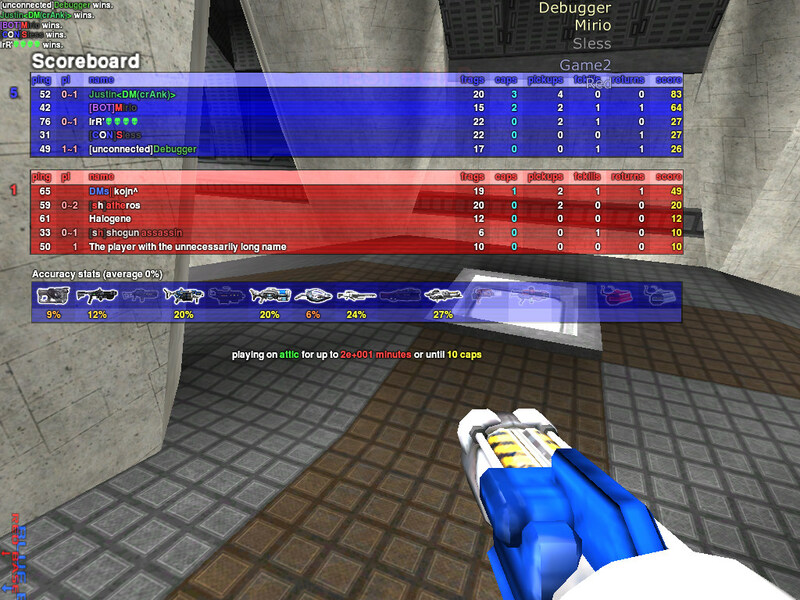 mIKEctf2 was some kind of weird from my point of view. Actually it did not feel like that we dominated sooo much. Though I can't get how nifrek got 8 caps. Blue team seemed a bit unorganized. And actually on Moonstone I thought red gonna lose this, cause we had a bad start and were good in defence for the first minutes and Blue used that time to get a 2:0 (or was it even 3:0?) lead. But somehow we turned this game into our favour then. Good games that were fun (for me (results might not look like that)).